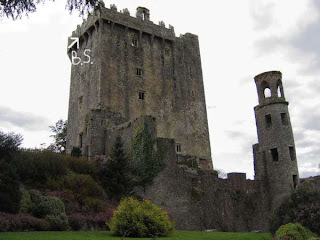 Cailin Travels: I kissed the Blarney Stone and it was awesome! Normally I think I'm a generally happy easy going person and I don't let things bug me but right off for this trip there were whining older people complaining about the weather, eating their stinky breakfast on the bus. Then as we drove the bus got all steamed up so we couldn't even take in the views of Ireland as we drove through it and also the 'tour guide' was just driving us and not giving us any info or history about Ireland. All he did do was repeat a few times where we were headed and that there were 2 groups of us, one group that I was in going to the Blarney Stone and the other group staying with him and going to the cliffs of Moher which he then says no trip to Ireland is complete with out seeing them... great for the 9 of us who aren't.... then he repeated a few times what the cliffs people would be seeing and never told us once what The Blarney people would do. Half way to Blarney we stopped to view the King Johns Castle in Limerick and the 9 of us got an even smaller bus to go to the Blarney Castle. This new tour guide/driver was Kevin and he was a way better tour guide with his thick accent from Cork and tried to fill us in in everything he knew about Ireland. He told me an interesting fact too! the Gardia (police) that they have don't have guns! they only have batons and just recently the government has thought about giving them tasers. I'm pretty sure they are the only police force in the world that don't carry guns! What do they do when someone is running from them?? "Stop! or I'll throw this stick at you!"?? but recently i think it was in Limerick they have been dealing with alot of gun violence so they brought in a special police force who carry guns to get rid of these bads and then they will leave once the job is done. Crazy eh? at the top it started to rain a bit but it was time to Kiss the Blarney Stone to get my gift of gab and eloquence!! 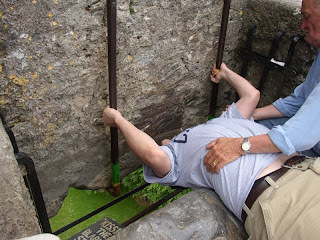 http://en.wikipedia.org/wiki/Blarney_Stone I just took these photos off the net as I can't upload mine at the moment but this is exactly what I saw. 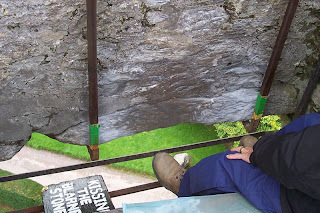 In the first photo you can see the Blarney stone at the bottom, its just that little sliver of rock that looks dirty from everyone kissing it..... eewwww haha and then you can see in the other photo how one would attempt to kiss the Blarney stone. You lay down on your back and shimmy yourself backwards and an old old man holds on to you as you lean back. But looks may be decieving once you are actually trying to do it, it is much farther away than it appears!! Its kind of scary because literally you are hanging upside down over the side of a castle thats at least 3 or 4 storeys high and all you have is an old old man trying to hold you up!! Then we drove back to Limerick to get back on our original bus and headed back to Dublin and we drove for 3 hours straight! The guy just bombed it in with no washroom breaks or anything. I'm not recommending these guys to anyone... but to each his own.